The EM-200 is a German equatorial mounting providing a stable support for any telescope up to 15 kg without the accessories (load limits 18kg, except counterweight). For example, Mewlon-210, CN-212 or TOA-130 OTAs will be comfortably exploitable with their equipment for astrophotography or CCD imaging. The couple of the motorization, more powerful than the old version, supports the use of the strong loads cantilever. The EM-200, with an ergonomic design and particularly adapted to the hard night conditions, was designed to face the most extreme visual and photographic challenges. RA/DEC motors are totally integrated inside the mount not laying outside any components that are easily lost during night observation. Strict assembly and use of high performance mechanical pieces features Takahashi mounts with a periodic error of _Ø 5 arcsecond by turn, while competitors just do not provide such specification. All EM-200 mounts have exactly the same mechanics. According to versions USD-3, Temma-2 Jr and Temma-2, only the motorization differs. USD-3 version has a double-axis drive with a standard handbox. In addition, the Temma-2 Jr and Temma-2 versions have a goto system, controlled exclusively by computer. The only specification that makes them different is the speed of pointing : 120x sidereal rate under 12V for Temma-2 jr (250x under 24V) and 350x sidereal rate under 12V for Temma-2 (700x under 24V). The integrated and illuminated polar finder (with light adjustment on the control panel) is amazing. Thanks to graduated concentric circles (UT date and time), precisely centered, it will point your mount (RA axis) towards the North celestial pole at a precision of 2', this without calculation. Once again, no comparison with other mount sold on the market, that are higher extremely complicated or imprecise and always let to the end-user dexterity. A built-in spirit level will help you to align quickly the polar finder, and by then you will not have to do the delicate operation of levelling the tripod. Last but not least, this polar finder runs until 2030 for both hemispheres taking into account the move of the North celestial pole due to the precession of the equinoxes. 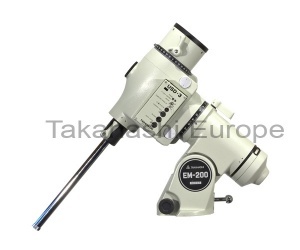 All EM-200 mounts are equipped with a double-axis drive including a handbox. The control panel features an autoguide port (compatible with SBIG CCD cameras) as well as a RS-232 serial port. Only Temma models have an automatic slewing "Goto" system with encoders. The control panel incorporates different connection ports (handbox, RS-232, autoguide and power supply), different switches (main switch and motor switch) as well as their related LEDs. All settings are either done through the handbox or through a PC connected to the mount. Made out of aluminium and with compact design, the handbox features a speed switch (normal/high speed with green/red LED), a RA/DEC reverser, a selector of hemisphere (North/South) and the four usual direction keys. For the Temma models, Goto operations will have to be done through a RS-232 cable (supplied) connected to a PC equipped with Pegasus 21 software (supplied) or any other software compatible with the Temma protocole.